In my experience and the experience of every policy veteran with whom I’ve ever spoken about the subject, Salehyan’s conjecture that “statistical forecasts are likely to carry greater weight in the policy community” is flat wrong. In many ways, the intellectual culture within the U.S. intelligence and policy communities mirrors the intellectual culture of the larger society from which their members are drawn. If you want to know how those communities react to statistical forecasts of the things they care about, just take a look at the public discussion around Nate Silver’s election forecasts. The fact that statistical forecasts aren’t blithely and blindly accepted doesn’t absolve statistical forecasters of responsibility for their work. Ethically speaking, though, it matters that we’re nowhere close to the world Salehyan imagines in which the layers of deliberation disappear and a single statistical forecast drives a specific foreign policy decision. Look, these decisions are going to be made whether or not we produce statistical forecasts, and when they are made, they will be informed by many things, of which forecasts—statistical or otherwise—will be only one. That doesn’t relieve the forecaster of ethical responsibility for the potential consequences of his or her work. It just means that the forecaster doesn’t have a unique obligation in this regard. In fact, if anything, I would think we have an ethical obligation to help make those forecasts as accurate as we can in order to reduce as much as we can the uncertainty about this one small piece of the decision process. It’s a policymaker’s job to confront these kinds of decisions, and their choices are going to be informed by expectations about the probability of various alternative futures. Given that fact, wouldn’t we rather those expectations be as well informed as possible? I sure think so, and I’m not the only one. Can forecasting conflict help to make better foreign policy decisions? Below Idean Salehyan grapples with the question whether forecasting conflict can help to make better foreign policy decisions? Most social scientists are concerned with explaining the behavior of individuals and groups: Why do some people commit crime? What explains the organizational decisions of firms? Why are some countries more democratic than others? However, an increasing number of articles on violent conflict have turned their attention to predicting things like war and state collapse rather than simply explaining their occurrence (here are a few examples: 1, 2, 3, and 4). Forecasts guide many of our decisions, such as what to wear tomorrow and where to invest our money. But can forecasting conflict and war help to make better foreign policy decisions? The advocates of conflict forecasting are often explicit about their desire to be ‘policy relevant’ by drawing attention to potential hot spots. Indeed, some of these efforts are funded by government agencies, such as the US Pentagon, which would like to develop better crystal balls (see here and here). Conflict scholars have long made arguments about what may transpire in the future, even if they are not explicitly engaged in forecasting. These assessments about troubled areas and potential violence are certainly useful and have undoubtedly played an important role in policy debates. Yet, scholars would do well to consider some of the normative issues involved in prognostication. For now, I will leave aside methodological concerns that arise in debates about forecasting, such as the ‘black swan’ problem (or the difficultly of predicting very rare but influential events, such as the ‘Arab Spring’). Assuming we can devise a method by which we are reasonably confident in our ability to forecast conflict—albeit with some error—what should we do with such knowledge? What ethical and practical issues arise when using forecasts to guide policy? I argue that scholars cannot be aloof from the real-world implications of their work, but must think carefully about the potential uses of forecasts. The following guest post is from UT-Austin political scientist Jason Brownlee, the author of Democracy Prevention: The Politics of the U.S.-Egyptian Alliance. The post originally appeared on the website of the Middle East Institute. Before 3 July 2013 enters the annals of U.S.-backed anti-Islamist coups it is worth noting that Mohamed Morsi’s ill-fated presidency differs from prior cases. Whereas the Islamic Salvation Front (FIS) and Hamas posed a threat (however chimeric) to Washington, Morsi quickly won plaudits from U.S. officials. Meanwhile, he menaced the domestic opposition with an autocratic panache. When Morsi exceeded his elected mandate and refused to share power, secularists and Salafists rose against him—while the U.S. Embassy in Cairo urged restraint. The distinctness of the Egyptian example limits how much one can generalize from this month’s events to the past overthrow or future prospects of elected Islamists. Morsi’s tenure diverged from other cases in three key respects: his assault upon rival state institutions; his alignment with U.S. foreign policy; and his adversarial relationship with more conservative Islamists. Speaking a week ago to ABC, Brotherhood spokesman Gehad el-Haddad said the Egyptian military’s takeover displayed “all the ingredients, political science-wise, of a coup.” Referring to how the army had shut down pro-Morsi television stations and detained Muslim Brotherhood leaders, he added: “It’s every ingredient of a full police state.” True enough, but if those are the ingredients of autocracy, el-Haddad’s colleagues in the presidential palace had been baking the same pie since last November. That’s when Morsi executed what was, “political science-wise,” a self-coup, or auto-golpe, by placing himself and the Islamist-dominated Constituent Assembly above judicial review. Although Morsi magnanimously let his supreme powers expire after voters approved the constitution in a referendum, his supporters besieged Egypt’s highest court to ensure it could not thwart the president. In subsequent months, Morsi used a familiar bag of dirty tricks against his opponents while his partisans captured the state. A caretaker legislature, dominated by the Muslim Brotherhood, tried to weaken the judiciary, thugs menaced television stations critical of Morsi, and the public prosecutor targeted the country’s most trenchant dissidents. El-Haddad’s observation notwithstanding, the 3 July coup is not a post hoc validation of Morsi’s own power grab. While some observers may liken the fallen president to Salvador Allende, his tactics recall the worst years of Ferdinand Marcos and Alberto Fujimori, democratically elected presidents who clutched more power than voters gave them. For the same reason that Morsi belongs in the company of Marcos, it is fallacious to place him and the Brotherhood alongside Islamist parties who were never so repressive. Before the FIS even built a legislative majority, much less started legislating, the Algerian army froze elections. In the Palestinian Authority, Hamas sought to build a bi-partisan coalition after its January 2006 election victory—only to be rebuffed by Fatah, which was in turn being egged on by the George W. Bush administration. The reported U.S.-backed coup attempt of 2007 was a final attempt to prevent the two sides from forming a national unity government. In sum, analogies between Morsi and other cases should start with his assault on institutions, not his religious ideology. Continuing our new series of collaborations with political science journals, we are pleased to present the following guest post from Tufts University political scientists (and blogger for Foreign Policy magazine) Daniel Drezner to discuss his article “Military Primacy Doesn’t Pay (Nearly As Much As You Think)” that appears in the current issue of International Security. In conjunction with this post, MIT Press will make the article freely available to all for the next 30 days; you can download it here. For the past generation, U.S. military hegemony has been a concrete fact of life in world politics. The coming austerity to the defense budget has triggered anxiety from some quarters of the U.S. national security community. Advocates for a large military argue that the world is safer and more prosperous today precisely because of the United States’ outsized security capacities and deep engagement with the rest of the world. Critics, however, have long questioned whether military preeminence yields the benefits claimed by proponents. Given the unchallenged military supremacy of the United States, some argue that is natural to target cuts in defense spending after a decade of dramatic budgetary increases. While these debates over the economic merits and demerits of military predominance are common in policy circles, there is less discussion about their theoretical and empirical foundations. What can international relations scholarship say about the relative economic benefits of military primacy? This article evaluates whether the economic benefits of military preeminence and deep engagement are as great as advertised. This evaluation proceeds by analyzing the most plausible arguments put forward for how military primacy can yield economic returns – and then assessing what the scholarly literature and evidence can conclude about those causal mechanisms. There are three plausible pathways: The “geoeconomic favoritism” argument posits that private capital will gravitate towards the military superpower because it provides the greatest security and safety to investors. The “geopolitical favoritism” argument is sovereign states, in return for living under the security umbrella of the military superpower, voluntarily transfer resources to help subsidize the costs of hegemony. Finally, the “public goods” logic argues that a unipolar distribution of military power is most likely to lead the provision of global public goods that accelerate global economic growth and reduce security tensions. These public goods benefit the hegemon as much if not more so than other actors. After reviewing the evidence, each of these arguments is less empirically persuasive than is commonly articulated in policy circles. There is little evidence that primacy yields appreciable geoeconomic gains. The private sector responds positively to a country’s military capability, but only up to a point; military primacy is hardly a prerequisite for attracting trade and investment. The evidence for geopolitical favoritism is also modest. Geopolitical favoritism does occur, but only during periods of bipolarity. Economic exchange is actually less correlated with security ties under conditions of unipolarity. The evidence for public goods benefits is strongest; military primacy does appear to be an important adjunct to the creation of an open global economy and a reduction in militarized disputes and security rivalries. Military supremacy is only one component of unipolarity, however. A decline in the hegemon’s economic power undercuts many of unipolarity’s posited benefits. It is only full-spectrum unipolarity that yields appreciable economic gains. At a minimum, therefore, this article suggests that the economic benefits from military predominance alone have been exaggerated in policy and scholarly circles. The principal benefits that come with military primacy appear to flow only when coupled with economic primacy. There are clear implications for U.S. foreign policy and fiscal policy. When applying the lessons from this analysis to U.S. grand strategy, the prescription seems clear; an overreliance on military preponderance is badly misguided. Again, it is not that military power is useless, it is that the law of diminishing marginal returns has kicked in. The United States would profit more from investing in nonmilitary power resources than in more military assets. An excessive reliance on military might, to the exclusion of other dimensions of power, well yield negative returns. Without a revived economy – and the global recognition of a renaissance in American economic power – the United States runs the risk of strategic insolvency. The United States needs to focus primarily on policies that will rejuvenate economic growth, accelerate job creation, and promote greater innovation and productivity. If the U.S. economy is perceived to be rebounding, then the biggest economic benefits that have been hypothesized to flow from military predominance will be preserved. As policymakers must choose between maintaining a large military and taking steps towards fiscal solvency, the results in this paper point strongly towards deeper cuts in defense expenditures. 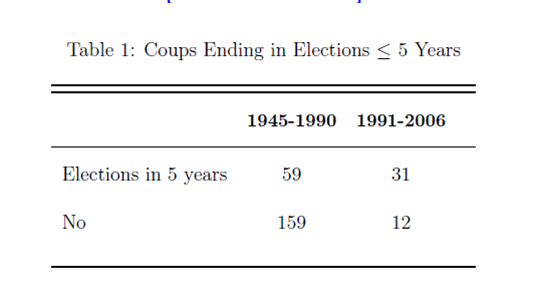 We use new data on coup d’états and elections to document a striking development: whereas the vast majority of successful coups before 1991 installed durable rules, the majority of coups after that have been followed by competitive elections. We argue that after the Cold War international pressure inﬂuenced the consequences of coups. In the post-Cold War era those countries that are most dependent on Western aid have been the ﬁrst to embrace competitive elections after the coup. Our theory also sheds light on the pronounced decline in the number of coups since 1991. While the coup d’état has been and still is the single most important factor leading to the downfall of democratic government, our ﬁndings indicate that the new generation of coups has been far less harmful for democracy than their historical predecessors. Egypt has a dilemma: its politics are dominated by democrats who are not liberals and liberals who are not democrats. [..] integrating Islamists is essential if Egypt is to have stable, democratic politics. Movements like the Brotherhood are a core constituency in Egyptian society; democracy requires their inclusion. If the millions in the streets want the Brotherhood out of power, they must learn to organize and campaign effectively, and vote them out. That would be the best way to establish liberal democracy in Egypt. Removing Mr. Morsi through a military coup supported by the secular and liberal opposition could well be the worst. We welcome another guest post from Elizabeth Nugent, a PhD student in the department of politics at Princeton University who is currently in Cairo, Egypt conducting pre-dissertation research. The summer of 2013 is proving to be the breaking point in the bitter political turmoil that has plagued Egypt following the January 2011 protests and ouster of former Egyptian president Hosni Mubarak. On July 3, democratically elected president Mohamed Morsi was removed from office in a decision made by the military, which simultaneously stripped Morsi of his powers and appointed the head of the Supreme Constitutional Court, Adly Mansour, as acting president, suspended the constitution passed under Morsi’s watch, and installed an interim government charged with holding early presidential elections. While Egypt’s midans cheered this as a solution to the political deadlock that had shut down the country for the better part of a week, Morsi, the Muslim Brotherhood, and their supporters were resisting his forced resignation with words, fists, and sticks throughout the night, and being met with widespread arrests. Some media accounts of recent events have categorized them as the result of conflict between two sides, an Islamist government pitted against a “mostly secular opposition” that “opposed the Islamist agenda of Mr. Morsi and his allies in the Muslim Brotherhood.” These descriptions may be applicable to the leading opposition parties within the National Salvation Front coalition, but it is not an accurate portrayal of the opinion of the majority of those reportedly 17.5 million individuals who participated in this weekend’s protests or the Egyptian people more largely. This false dichotomy suggests that these protests and tensions center on issues related to religion and state, and implies a certain misunderstanding of Egyptian political attitudes. It would be a mistake to read the mobilization against the president and in support of the military as simply anti-Islamist, as a political ideology. These protests and mobilization have been anti-Muslim Brotherhood, as a political entity – albeit an Islamist one – whose political party, the Freedom and Justice Party, has failed its constituents. The Tamarud campaign which first initiated this week’s mobilization focused solely on the political failures of Morsi in terms of substantive domestic and foreign policy issues, outlined in the petition circulated and signed by over 22 million Egyptians, without referencing any issue pertaining to the relationship between religion and state. One, then, would be hard pressed to describe current events in Egypt as a referendum on Islamism – unless one incorrectly equates Islamism, in Egypt or more generally, exclusively with the Muslim Brotherhood. While the FJP’s governing days may be over, it is too soon to declare the end of Islamism. Islamism can be defined as support for the introduction of Islamic tenets into political life through the implementation of sharia. This admittedly vague definition allows us to classify both parties (those with political platforms promoting sharia) and individuals (those who agree with the concept of implementing sharia) as Islamist. Recent survey data suggests that the vast majority of Egyptians are Islamists, as they continue to support in high numbers the implementation of sharia and its introduction into their country’s laws. In April 2013, Pew released a report titled “The World’s Muslims: Religion, Politics, and Society”, which included a nationally representative sample of 1,798 Egyptians. The data was collected in November and December 2011, and hardly paints a picture of a stark secular-religious divide, or wide scale support for secularism in the definition commonly used. Rather, Egyptians overwhelmingly support the integration of religion and politics. Admittedly, these data are almost 2 years old, and were collected before Morsi took office. But more recent polls suggest the same strong support for Islamism continues, and the large scale swing in support for Morsi did not occur in tandem with a wide scale swing in support for Islamism. Pew recently released another report (“Egyptians Increasingly Glum”) using survey data collected in March 2013 among a nationally representative sample of 1,000 Egyptians. 58 percent supported having Egyptian laws strictly following the Quran, down only 4 percentage points since the center asked the question in 2011. An additional 28 percent supported Egyptian laws following the values and principles of Islam (compared with 27 and 32 percent in 2011 and 2012, respectively). While the percentage of those who did not want Egyptian laws to be influenced by the Quran rose from 5 percent in 2011 to 11 percent in 2013, the vast majority of those polled continued to support Islamism. This public opinion data suggests an interesting distinction we have not yet fully made in analyses of current events in Egypt. Egyptian citizens overwhelmingly support the mixing of religion and politics. They also just protested in historic numbers against an Islamist ruling party. The political questions facing the Egyptian electorate, then, appear to be what form of Islamism, which Islamists, which of the social, economic, and political laws included in sharia to implement, and how – and perhaps most importantly, how to balance all of this with a democratic system reflecting the will of the people (the data similarly reveal high levels of support for democracy among Egyptians). In post-Mubarak Egypt, where the Brotherhood is no longer the only Islamist game in town, we do ourselves a disservice to think about Egyptian politics as a binary of pro- and anti-Islamist. There are currently a number of Islamist parties for Egyptian voters to consider, including but not limited to the Building and Development party, formed by the once violent Gama`a Islamiyya and which seeks to establish a democracy based on sharia law; the Flag party, founded earlier this year by popular cleric Sheikh Hazem Salah Abu Ismail; the Nour Party, a Salafi party that surprised by winning almost a third of contested seats in Egypt’s 2011 parliamentary elections; the Watan party, which split with Nour over disagreements over the level of political involvement from Salafi clerics. At the very least, Egyptian political currents might currently be divided between three strands: pro-Brotherhood Islamists, anti-Brotherhood Islamists, and secularists. Even better, we might start to think of Islamism as a spectrum – with more and less Islamist individuals and parties, conservative and liberal Islamists and parties – based on developing political ideologies and concrete political platforms. So what, then, does June 30 and its aftermath tell us about support for Islamism in Egypt? It doesn’t tell us that Islamism, as a political ideology, is any less popular in post-Mubarak Egypt than it was before 2011. It does, however, demonstrate that Egyptian political actors are continuing to negotiate the relationship between their religion and their politics. It reveals that Islamist parties will be treated just like every other kind of party. Despite the religious nature of some or all of their political platforms, goals, and rhetoric, they will not be above demands for accountability from the Egyptian electorate. When Islamists fail in office, they will be threatened to be voted out. When they fail in a manner that a critical mass of citizens deems unacceptable, they will be protested against – and in large numbers. Further, it emphasizes the importance of maintaining legitimacy in the eyes of the people to future Islamist political contenders, which can be done through establishing, maintaining and abiding by the rule of law as well as through working with opposition parties across the political spectrum. As we continue move forward with contested politics in Egypt, I suggest that we think beyond the pro- and anti-Islamist divide, and more carefully consider the complicated and nuanced issues defining Egyptian politics during the current difficult impasse.